Looking to buy safety rain pants and trousers in Rochester NY, Ithaca NY, and Western NY at competitive prices & with exceptional service? 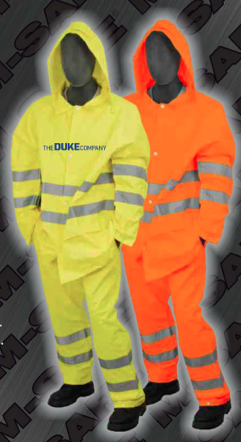 The Duke Company proudly carries the finest Safety Rain Trousers – ANSI 107-2010 Class 3 Rain Pants in High Visibility Yellow and High Visibility Orange. Meets high standards of ANSI / ISEA 107-2010 Class E.
Waist is equipped with elastic. Fly and legs are equipped with durable naps. Convenient access to pockets via slash sides.